Honor your allegiance with House Stark and carry the wolf's banner into battle. Summon the courage to ride with Robb Stark in his campaign against House Lannister. Call upon the thundering lancers of House Umber, the shieldmaidens of House Mormont, and the trident bearers of House Manderly. Will you heed the north in its hour of need? The Wardens of the North reinforcement set adds more Stark commanders and units to the Stark forces of the Battles of Westeros core set. Players can use these new units to take part in battles set in George RR Martin's Song of Ice and Fire fantasy series or make their own fantasy battles. Wardens of the North includes a Rules and Battle Plans book, 32 plastic figures and their bases, 10 banner poles, 32 cards, 8 terrain overlays, and 18 tokens. 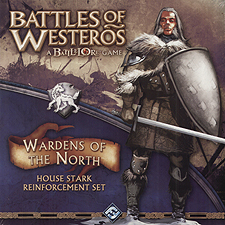 Wardens of the North is not a stand-alone game; a Battle of Westeros Core Set is required to play.